DES MOINES – The Iowa Barnstormers have signed their first player of the 2018 season. Running back Donavan Williams will join the team’s training camp roster, Head Coach Dixie Wooten announced today. 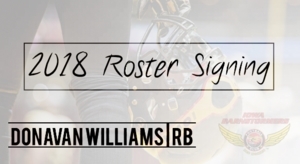 Williams (6-0, 215, Sam Houston State) joins the Iowa Barnstormers for his second season in the Indoor Football League (IFL). Williams originally signed with the team prior to the 2017 season, spending a brief stint on the roster. Collegiately, Williams played two years at Sam Houston State University (SHSU). In 2014, Williams became the 10th SHSU running back to rush for more than 200 yards in a game with 13 carries for 212 yards and 3 touchdowns. Before attending Sam Houston State, Williams spent time at ASA College where he earned NJCAA All-America honorable mention and All-Northeast Conference running back as a sophomore. Season Tickets for the Iowa Barnstormers 2018 season are on sale now for as low as $80 per seat. Don’t miss a minute of the action! For more information, call the Barnstormers at (515) 633-2255 or log on to www.theiowabarnstormers.com.